Have you ever suffered from dry skin, bloody noses, a dry throat, or nose irritation? If you are a human, the answer is most likely yes. Moisture is important to remaining healthy and comfortable – but sometimes living in a dry climate, through a dry season, or in an old building means that dry air is unavoidable. Fortunately, humidifiers can help way-lay some of the worst effects of dry air. I grew up in Upstate NY. Despite the blanket of snow on the ground every winter, the air is actually really dry between November and March. My mother used to keep a humidifier in my room every night. They were giant, noisy machines that always sat on a towel so that they wouldn’t leak into the carpet. Whenever I would spend a night away from home, I would come home with a sore throat and cracked lips. Having a humidifier with me was key. Fortunately, today our options for avoiding dryness aren’t as limited as they once were. Travel humidifiers have even hit the market – something I would have killed for in my tiny dorm as a freshman. So if you are prone to the effects of a dry climate, make sure you have got one of these in your bag. This battery/USB powered humidifier has an attachment for a water bottle – so you don’t even need to worry about a water tank. It is so small (you may actually lose it in your bag) but fits nicely on a small nightstand or even on the dashboard of your car. It will last up to 8 hours with an automatic shut off, but that time can be adjusted to 2 hours, 4 hours, or 6 hours per your preference. Last year I went to southeast Asia. A lot of the hostels I stayed in were housed in older buildings with really dry, stale, air. I wish I had one of these to throw in my luggage! Given the prevalence of bottled water across the world, it would not have been difficult to set up and keep running. The next time you head somewhere that even has an inkling of being dry, throw this in your luggage to be safe. This device is so much more than a humidifier. It is a humidifier, home décor, and a nightlight. 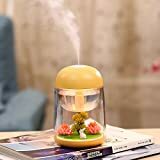 Not only does it mist out humid air, but it has a cute little nature scene lit by LEDs which includes pebbles that filter harmful particles out of the air. It is powered by USB, and the spray timer can be set for up to 6 hours with an automatic shut off. Available in four pretty colors, it is also a great solution for children, or for anyone who enjoys some ambient light at night. It is small and quiet, so it won’t disrupt you while you are working or sleeping. Seeing as it is only slightly larger than an oversized mug, it will not get in your way either. This humidifier can be charged via USB and will spray continuously for four hours, or intermittently for eight hours. It will automatically shut off when the tank runs out of water – an important safety feature. You can set the nightlight pattern to a seven gradient color mode for some nice ambient light. It comes in white or blue and is small enough to fit in your car’s cup holder. There are only four steps to use: Open tank, add water to the tank, twist cap close, and push button to start. You will be amazed at how such a simple machine will improve your quality of life in a dry climate. 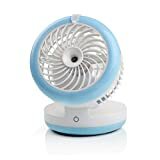 This device doesn’t look like a traditional humidifier, but it is great if you want a targeted mist charge. If you are feeling under the weather, this is a great way to keep the air in front of your face misted. It has four modes: fan low, fan high, fan and mist low, fan and just mist. It is powered by a rechargeable battery and is charged by micro USB. The battery lasts longer or shorter, depending on whether the fan is on low or high. The fan can be collapsed down to the size of a coffee cup for portability and then props open to fan and mist. It is a great solution for anyone who wants to control mist direction. 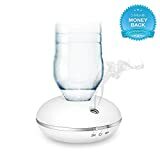 This humidifier not only adds mist to the air but scent too. There is a tank for water and a spot for a few drops of the essential oil of your choice. Through diffusion, your house or bedroom will soon be permeated with a light, lovely scent. It is only 6 inches x 4 inches, so it should travel easily. The runtime is about two hours with an automatic shut off for safety. It charges through a USB port and has a dim, ambient light, which clues you in that the device is on. 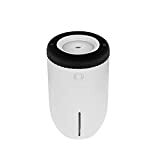 So whether you are looking for a humidifier for your car, your bedroom, your office, or a travel one that always lives in your backpack, there is a solution on the market for you. Just make sure that the noise, light, or scent will not bother anyone around you. You are all set to reap the benefits of increased humidity.